First FBM Saturday was a success. The tension in Westhill was one of a kind, when 19 drivers on the grid waited for green lights. Lap 1 was completed without wrecks: for an open league that's remarkable. Today we have an update for you with some important fixes and some new features. This is not the graphics update we have been talking about in recent progress reports. This one is fully compatible with the existing public version. Round 3 with LX4 turned out into an epic thriller. Series leader Nova got serious challengers and showed great sportsmanship while finally won the race. The so far most popular round had 20 cars in the start and 13 of them survived the contest. Round 2 with XRT was raced last Sat and it was at least as much fun that first round. We had 19 cars starting the adventure while just 9 of them saw the jacket flag. Go and watch the video of opening lap in the Round 2 results page. 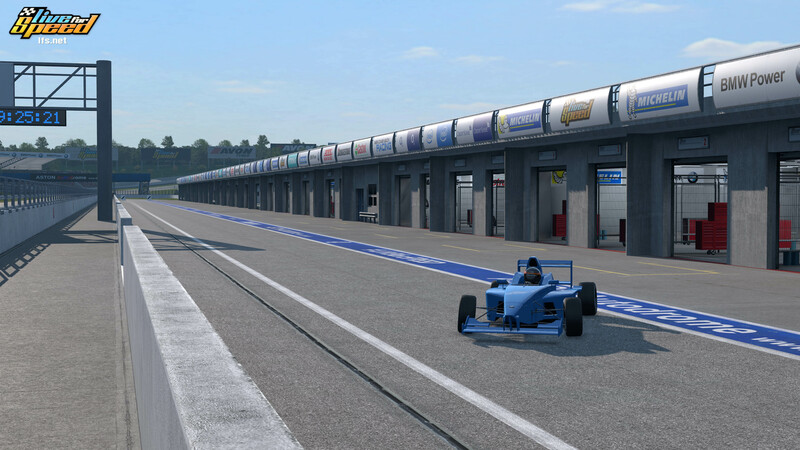 Last Lap Motorsports (LLM) started the fourth season of the Open Endurance Cup with a pole position and a flag-to-flag victory in Kyoto, as the championship saw the first use of an open configuration with a custom pit lane. The “North” configuration of the Kyoto Ring uses the track’s infield and the second turn of the oval, with the custom pit lane located between oval turn 3 and the transition to the infield. After trhee seasons with multi-class competition, only GT2 cars were allowed on track for the season opener. Round 1 was raced last Sat and it was much fun. 17 bold racers in their RB4 cars started the race, 11 survived to the jacket flag. Go and watch the video of opening lap in the Round 1 results page. Fragmaster's GTi Thursdays is still running strong. Love Affair @ Fern Bay race series starts soon! If you like road cars and Fern Bay, this may be for you! We will race 4 rounds on custom Fern Bay configurations including all aspects of Fern Bay, and some special stuff like the Karussell curve, Superspeed bridge, and more. Start reading here and sign up to join the fun. For this month's progress report we will show you some images of the updated Westhill track. 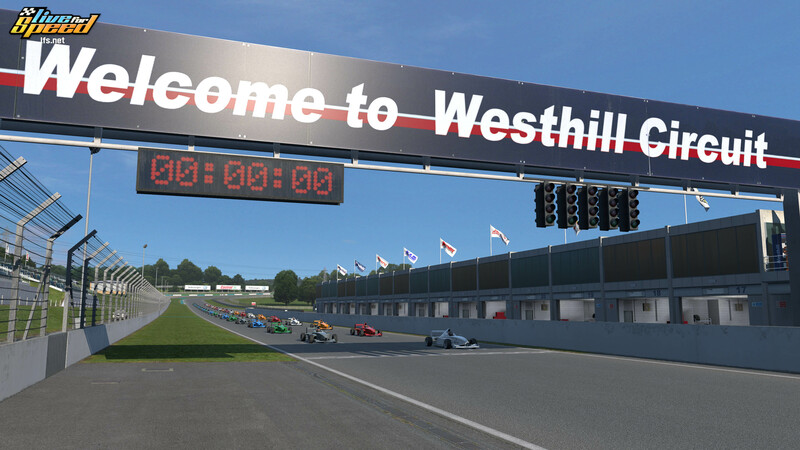 As Westhill is one one of our more modern track areas, it didn't need to be reworked as heavily as some of the others. 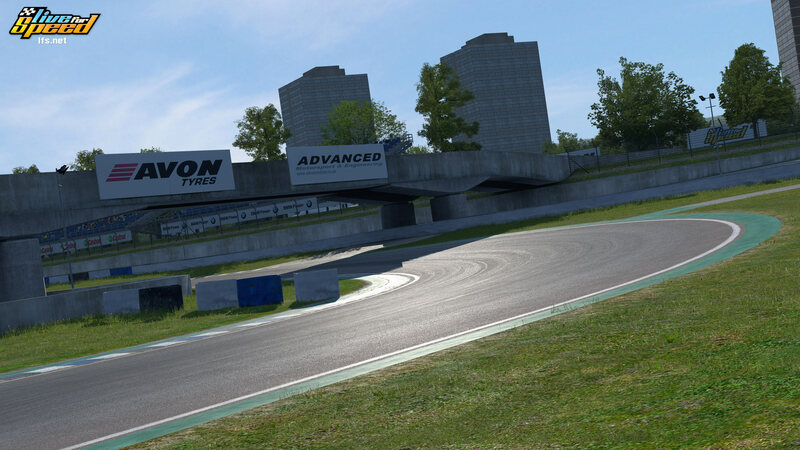 Textures have been updated to take advantage of the new lighting system, new 3D kerbs have been added and there are various scenery updates around the track. Race Green Events will start the 8th season of it's longest running championship,money prizes at stake once again besides the battle for 6 individual titles,a teams title and nations title. 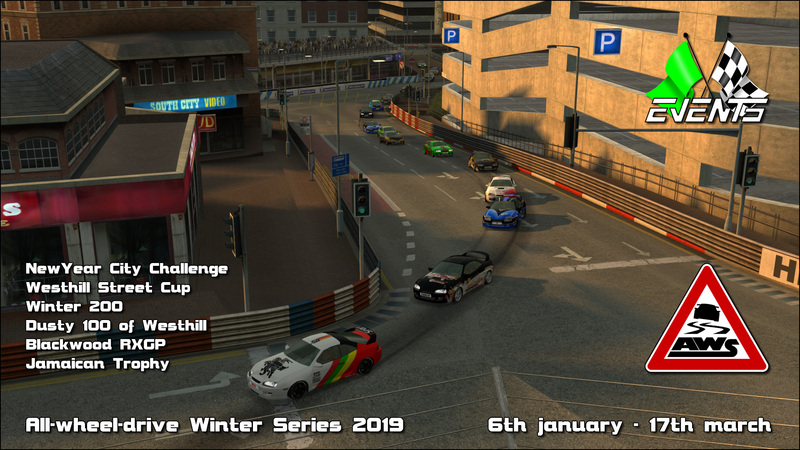 As everyone can read from the league name All-wheel-drive Winter Series,it's a league run in winter and using both LFS's AWD cars. 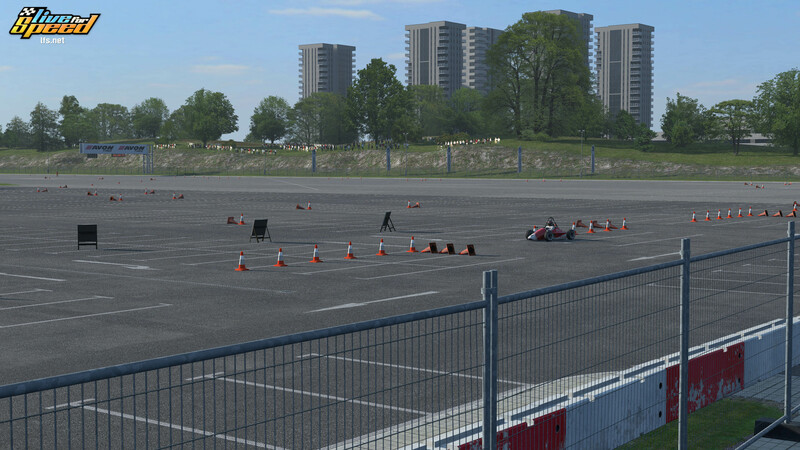 The season will consist of 6 rounds,where each car will be used in 3 of them. We have been working on graphics for some time now. A new lighting system allows more varied and realistic surface properties and we have a new shadow system. All tracks must be updated to take advantage of the new features. Signups for OEC IV start! 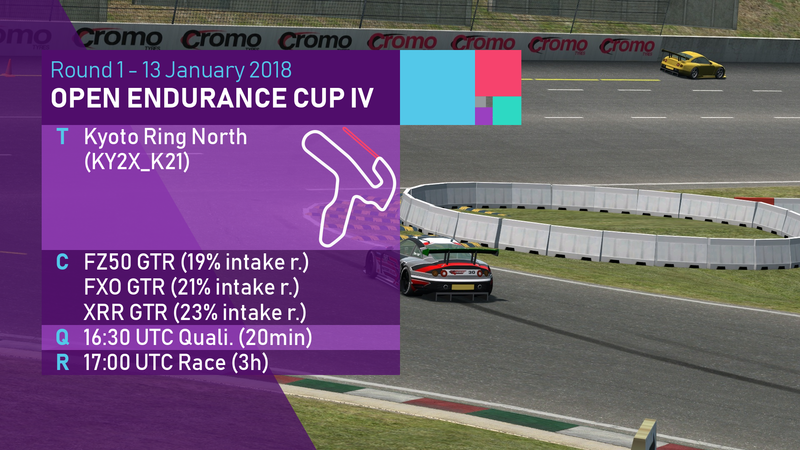 We are four weeks away from the start of the fourth installment of the Open Endurance Cup. This time, the league is an exclusive GT2 league with final restrictions still to be announced. Another change after the two year hiatus is the format. A 20-minute qualifiyng session will precede the three hour long races. In the August and September progress reports we talked about the new shadows and lighting system and showed pictures of the updates on the Blackwood and Rockingham tracks. All our tracks must be updated to use the new lighting system and some older tracks need more changes to bring them up to date. Aston is one of them and is the subject of this month's report. In the August progress report we talked about the new shadows and lighting system and showed pictures of the updates on the Blackwood track. 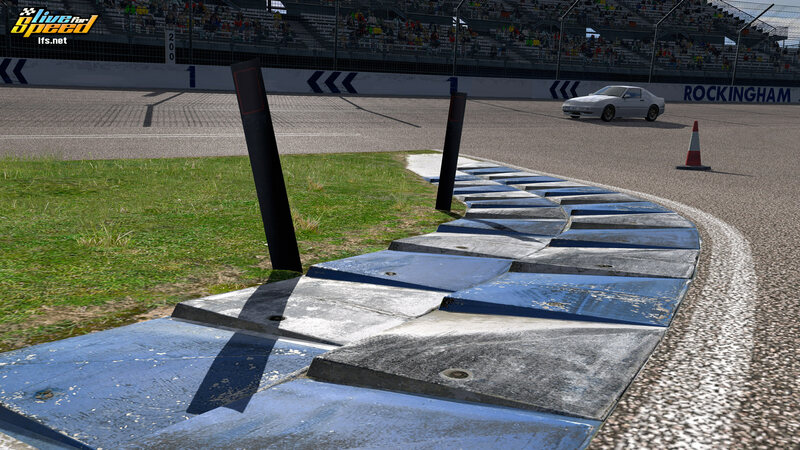 This month you can see some screenshots of the Rockingham track, including real vs virtual comparisons, and a few pictures of shadows working with moving objects and the layout editor. Read the whole report on the Graphics Progress Report: Rockingham page. We have been working on graphics most of the time since early 2017 and we can now show you some of the results. 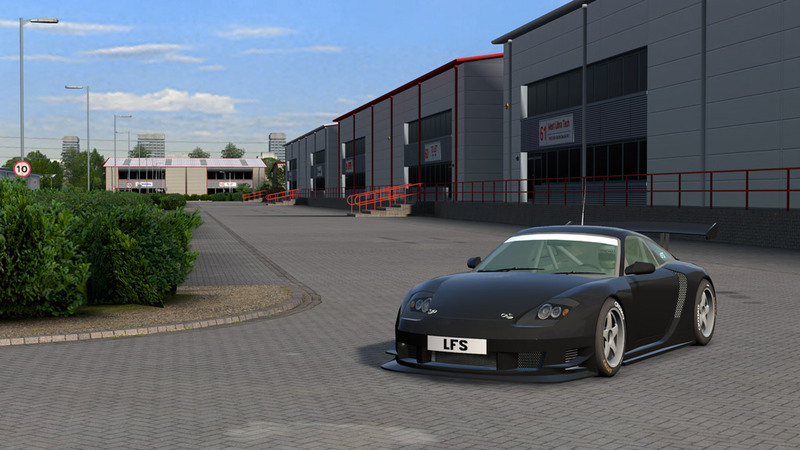 You will instantly notice the the new detailed shadows and shine on the road surfaces. Looking around, you will start to see that many more surfaces have some sort of shine level. Today we have released a new update. After some disruptive attacks that took place recently we were forced to make our website and multiplayer systems more robust. As an update was needed, we took the opportunity to do a few more improvements, including some extensive changes to the layout editor. LFS Hotlap Championship 2018 - Week 11. Car for week 11 - UF1. LFS Hotlap Championship 2018 - Week 10. Car for week 10 - UFR. LFS Hotlap Championship 2018 - Week 9. Car for week 9 - RAC. Westhill National - 20 laps. LFS Hotlap Championship 2018 - Week 6. Car for week 6 - FBM. LFS Hotlap Championship 2018 - Week 5. Car for week 5 - MRT. LFS Hotlap Championship 2018 - Week 4. Car for week 4 - FXR. LFS Hotlap Championship 2018 - Week 3 started. Car for week 3 is LX6. What is this championship all about? SORL Round 2 - Kyoto National. This time out for SORL we'll be going to Kyoto, to the half oval and inside track of the National configuration.